Bent Creek, known for its little designs that can be put together in a theme, has come up with a design based on the Red Thread. 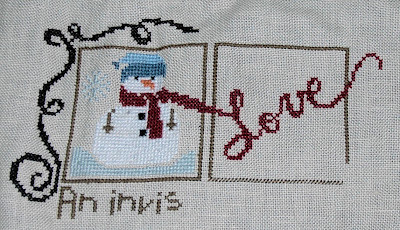 There is a little design for each month that can also be stitched separately for an ornament, and there is a separate chart for the border. The idea is that the red thread flows through the whole design, tying each one to the other. It will look like this when it is completed. Generally, I do not like to stitch "cutsie" things, nor do I like charts that are spread out over a year, but this one caught my eye. I am stitching it on 32 count Light Mocha. I decided to use DMC instead of the hand dyed threads. I think the DMC looks just fine, and I have the all the colors on hand, which is a plus. After working on The Chase Sampler for five months, I needed a little change of pace, something lighter! As soon as I get caught up with the third month, I will probably start on another little design. I haven't quite decided which one I will do just yet.